Here are some of the most common questions about investing in precious metals. Click any of the questions below to view the answer. If you have a question, please call one of our Precious Metals Specialists at 1-800-326-9598 or contact us. Should I buy physical gold or gold stocks? Owning gold means you have a physical asset that can be touched, felt, and held. Not only does it have eternal value, it’s also insurance against a collapsing financial and monetary system. Gold stocks are purchased not for their protection against the financial system, but rather for their profit potential. Mining companies are financial assets which are affected by credit conditions and market volatility, and for this reason they carry risks associated with that fact. Can I buy gold or other precious metals at spot price? Most individuals know the spot price as the number used to track the value of raw precious metals on any given day. However, these prices that you may often see quoted on TV or the Internet are different than the actual selling price of precious metal coins and bars. 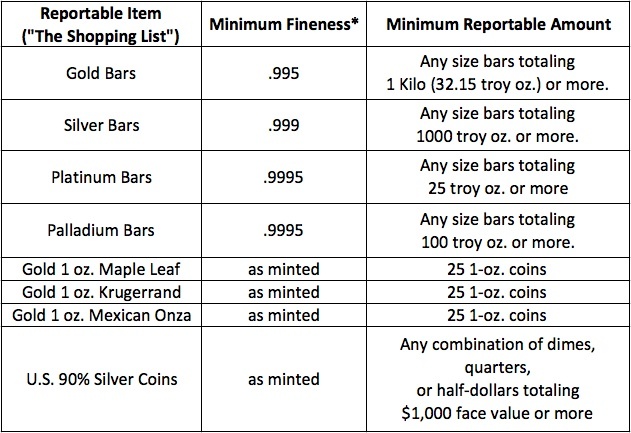 In detail, the extra cost of any coin or bar over the spot price is the result of a number of factors, including 1) manufacturing, distribution, and administration costs incurred by the mint or refinery that produced the coin or bar, and 2) any markups,representing the cost of sale and the profit for the wholesaler selling the coin or bar to the retailer. The retail dealer or gold broker (such as American Bullion), in turn, will mark up the wholesale price to cover its costs and realize a profit when pricing the coin or bar for the purchaser/investor market. This series of incremental price increases applied to coins and bars as they pass through the distribution chain is a typical market mechanism present in virtually every other industry in existence, from auto parts to zippers. How long should I plan on holding my metals? Physical precious metals are considered long-term investments. The recommended time frame for holding them is 5 to 10 years or longer. Planning for the long-term is a better way to understand what precious metals can do for your portfolio and your financial future. Precious metal values go up or down depending on many factors, included but not limited to the conditions of the U.S. and world economies, geopolitical crises, and the principle of supply and demand. Do I have to be a collector to invest in gold? Most precious metal investors are not coin collectors. There are some individuals that find interest in coin collecting as a way to diversify their assets while furthering their hobby. If you are interested in beginning a precious metals coin collection, our precious metals specialists can assist you with any questions. *For bars, any hallmark regardless of whether that hallmark is accepted as “good delivery” on any of the commodity exchanges. How do I set up a Gold IRA? The process begins with opening a self-directed IRA. American Bullion will assist you with setting up an account with Self-Directed IRA Services (SDIRA) who will function as your IRA custodian. Once your account is open, American Bullion processes the transfer or rollover from your current custodian and moves any cash into your new self-directed IRA. Once the funds are available in your account, American Bullion will place your order for precious metals such as gold and silver and ensure they are shipped directly to the Delaware Depository for storage. Can I participate in precious metals investing with my IRA or old 401(k)? Yes. You can participate in precious metals investing by adding gold or silver to an IRA. The most common method for precious metals investing is holding metals in a self-directed IRA. Employer-sponsored plans such as a 401(k) can only hold certain types of investments. Gold and silver are generally not permitted. Who is the custodian of my Gold IRA and what are their fees? *Annual account fees may vary if the amount invested is above $100,000 or if the metals are stored in a segregated storage facility. A direct rollover is a tax-free transfer of funds from one retirement plan to another. Distributions from a qualified retirement plan may be transferred to another retirement plan or an individual retirement account (IRA), while funds from an IRA may be rolled over to another IRA. During the rollover process, your current custodian will carry out its process for liquidating your investments. Once that is done, the resulting funds will be sent to your self-directed IRA where they can then be used to purchase precious metals. When can I start withdrawing money from my IRA? You can withdraw money from your IRA whenever you want, but if you are under age 59 ½ you will pay a 10% penalty on the amount you withdraw in addition to the regular income tax you’ll owe on the withdrawal. This is the government’s way of discouraging you from cashing out before you retire. If you are over 59 ½, you can make penalty-free withdrawals (known as “qualified distributions”) from any IRA. You will still owe income tax on the amount withdrawn, unless it’s from a Roth IRA and it has been at least five years since you first began contributing to it. American Bullion and its agents are not tax professionals. If you have any questions concerning the tax implications of owning an IRA, consult a tax professional. Is the rollover process tax-free? Yes. IRA rollovers are tax-free when the money is transferred from an employer-sponsored pension or other qualified plan to an individual retirement account (IRA) and is deposited within 60 days, or by instructing a financial company such as American Bullion to transfer it to a second institution on your behalf. As long as the new deposit is made within 60 days, there is no tax liability. What’s the difference between a Traditional and Roth IRA? The main difference between a Traditional and Roth IRA is the way contributions are deducted for tax breaks. With a Traditional IRA, you pay the taxes when you withdraw the money in retirement. With a Roth IRA, you pay the taxes on the front end, but there are no taxes on the back end. Your money grows tax-free while in either a Traditional or Roth IRA account. Anyone with earned income can contribute to a Traditional IRA, however there are income limits for contributing to a Roth IRA. Whereas contributions to Traditional IRAs are either deductible or non-deductible, Roth IRA contributions are always non-deductible. As a result, Roth IRAs offer tax-sheltered growth, whereas Traditional IRAs offer tax-deferred growth. Roth IRAs are more flexible if you need to withdraw some of the money early. With a Roth IRA, you can leave the money in for as long as you want, letting it grow and grow as you get older and older. With a Traditional IRA, you must start withdrawing the money by the time you reach age 70½. American Bullion and its agents are not tax professionals. If you have any questions concerning the tax implications of owning an IRA, consult a tax professional. Can I take physical possession of my Gold IRA metals? Metals purchased for a retirement account must be sent directly to the depository in order to avoid IRS tax penalties. After reaching the IRS-defined retirement age, individuals can request a distribution in the form of their precious metals and begin taking physical possession at that point. 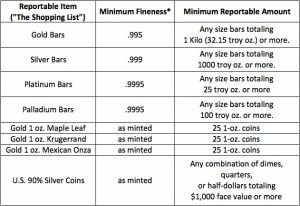 After an order has been placed for a self-directed IRA, the precious metals will be shipped directly to the Delaware Depository. The process of shipping, logging, and moving the metals into the vault usually takes about 7 business days. Precious metals purchased with cash (not retirement funds) are purchased and shipped after the order is completed. The shipping and processing time will vary based on the amount and types of metals purchased, but customers will typically receive their order within about 7 business days. How can I buy precious metals from American Bullion? To inquire about or make a purchase of precious metals, please call American Bullion at 1-800-326-9598 and our precious metal specialists will assist you. Do you need my Social Security Number (SSN) when I buy coins/bars? Yes. A valid Social Security number is required when a new self-directed IRA is opened. A Social Security number may or may not be required when you make a cash purchase, depending on the type of transaction. A precious metals specialist at American Bullion will be able to answer any of these questions, just call 1-800-326-9598. Am I buying real gold or a certificate? American Bullion does not deal in paper-backed assets. All of our clients are purchasing physical gold, silver, platinum, and/or palladium. Where and how do I wire funds? Wire funds are easy to set up and are usually completed on the same day. To receive the necessary information for American Bullion’s wire transfer account, please contact our precious metals specialists at 1-800-326-9598. Yes. American Bullion recommends a minimum rollover amount of $10,000 to account for any fees associated with the process. Are my metals insured while in transit? Yes. All precious metals ordered through American Bullion are insured for their value while in transit. If you are purchasing gold directly, it will be insured up until the point where you sign for the package. If you are purchasing gold for an IRA, it will be insured while in transit to the Delaware Depository. Once the depository signs for the package, it will then be insured under their policy. Orders for precious metals placed with American Bullion are shipped via express mail with the US Postal Service or FedEx. How does American Bullion compare to its competitors? American Bullion is proud to be an industry leader in Gold IRA rollovers. We have achieved this through our passion for excellence and our commitment to a hassle-free experience. American Bullion handles the entire rollover/transfer process for our clients. From start to finish, we ensure the transaction is completed swiftly, safely, and securely. How can I receive more information from American Bullion? You can receive more information about American Bullion by calling 1-800-326-9598 or by visiting the American Bullion contact page.